Super League champions Leeds Rhinos will be looking to defend their World Club crown when they face NRL Champions Melbourne Storm on Friday at Headingley. Kangaroo stars Cooper Cronk and Cameron Smith will line up for the Aussie side, against Leeds' Golden Boot winner Kevin Sinfield and Super League's leading try-scorer of all-time Danny McGuire. McGuire - into his testimonial year - has won five Grand Finals and the World Club Challenge three times with the West Yorkshire club. "I have been fortunate to be at Leeds since I was 13 and have loved every second of it," he told BBC Sport. "The World Club Challenge is a game that you look forward to and want to be involved in. "Once you win the Grand Final, you know you are going to be playing in this massive game." Wello has been at the top of the game for the last 10 years or so now. He has been extremely consistent over this period of time and has been a major part of St Helens' success during this period. Did you know? Wellens has played over 400 games for St Helens. Albert was a guy with plenty of speed in his legs and he was a first-class finisher in his time for the club after coming over from Australia. I remember him grabbing plenty of tries against us in big games. Did you know? Albert was crowned the first ever 'Super League's Fastest Man' after a sprint race in 2004. Lyon came to Super League from Australia in his prime and fitted perfectly into the St Helens side. He has been a Kangaroos international and was very dangerous and difficult to defend against. His greatest assets were his footwork and speed. Did you know? Lyon was named Man of Steel in his debut season in 2005 and captained Manly to their 2011 NRL Grand Final win. Hape was a very strong centre who had unbelievable footwork. He achieved great success at Odsal and formed the deadliest partnership I have seen alongside Lesley Vainikolo. That was one of the main reasons why they won so many Super Leagues and World Club Challenges. Did you know? Hape featured in New Zealand's first ever Tri-Nations final win in 2005 - when they beat Australia 24-0 at Elland Road. He was known as 'The Volcano' and was such a handful when we played against Bradford. His size and speed was like no other player and he scored tries for fun. He was always someone we had to watch closely when playing against the Bulls. Did you know? Vainikolo holds the record for tries in a Super League season with 36 in 2004 (the year Danny McGuire scored 35). Robbie was the first player when I made my debut that I looked at and thought how strong, fast and athletic he was. He was one of Bradford's main players during the early days. He was someone I looked up to as he had all the ability to beat men with his skills. Did you know? Paul was the 'face' of Super League who captained the Bulls to the Treble in 2003 and World Club Challenge glory in 2004. Longy was a superb organiser and I was fortunate to get to work with him for England. Very skilful with a top kicking game and an all-round gifted number 7. He has good understanding of the game which is important for a player in that position. Did you know? Long was Man of the Match when Great Britain defeated Australia in Sydney in 2006 - their first win Down Under in 18 years. 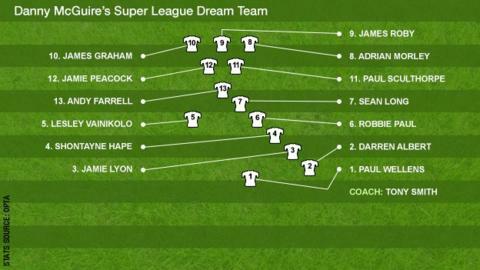 You cannot have a Super League Dream Team without Mozza in the side. A beast of a player and just so tough to play against. He did really well in the NRL with Sydney Roosters, winning the Grand Final there and is someone who is respected around the world. Did you know? Morley is England and Great Britain's most capped player with 52 combined. I was close to choosing Keiron Cunningham, but I'll go with Robes. He has been at St Helens his whole career and I played against him in the academy as well as Super League. He is very professional and has been loyal to his club which you don't see these days. Did you know? Roby was Super League's leading metre-maker and tackler in 2012 - including play-off appearances. James was a workhorse front rower and got on with bashing the opposition every time he was on the field. However, he also had the special ability to be a ball-player too. Now playing Down Under, he is doing well for the Canterbury Bulldogs in the NRL. Did you know? Graham was the third highest metre-maker in the NRL last season (3412m) after Brett Morris (3678m) and Isaac Luke (3564m). Scully was one of the best all-round players Super League seen. I got to work with him for Great Britain and he was a great leader, very strong, and another who could organise the team well. He was just extremely talented as a player. Did you know? Sculthorpe became the first player to retain the Man of Steel award by winning it in 2001 and 2002. Ever since his Bradford days, JP has been a handful for the opposition. He has an awkward style of running and playing against him was extremely tough. Without doubt, he is the best signing the club has made, to get him in his prime was massive coup. Did you know? Peacock captained his country on 16 occasions - more than anybody else. Farrell had a great aura around him and you could see what a great leader of men he was. He carried Wigan on his own a number of times and got them out of trouble with his great kicking game, especially his goal kicking. Did you know? Farrell scored over 200 points for Great Britain and England, their third highest points-scorer of all-time. Smithy was with us and achieved great success but he is now part of the opposition camp. He set a really good culture at our club and set the standards that we are still carrying today. Since then, he has transformed Warrington into a major force in the competition. Did you know? Smith guided Leeds Rhinos to their first title in 32 years in debut season in 2004.